While ectothermic animals reach their greatest abundance and diversity in warm, tropical locations, many lizard species are able to survive in less than ideal regions. Despite the state’s frigid winters and relatively short summers, Illinois is home to six lizard species. While all six species have similarities -- such as their largely insect-based diet -- each has adapted to fill a different niche. Three skink species live within Illinois’ borders, including five-lined skinks (Plestiodon fasciatus), broadhead skinks (Plestiodon laticeps) and ground skinks (Scincella lateralis). Ground skinks are common but rarely noticed, as the small lizards live secretively in the leaf litter, hunting small beetles, ants and flies. 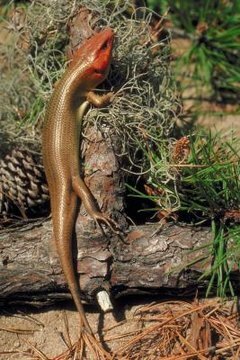 Five-lined skinks are equally comfortable in the trees or on the ground, and frequently live around homes and buildings. The largest and most arboreal of the three species, broadhead skinks consume invertebrates, but also add other lizards to their diet. Skinks exhibit caudal autotomy, meaning their tails will break off grabbed by a predator. When this happens, it distracts the predator -- whose attention shifts to the detached, wiggling tail -- allowing the skink to escape. Usually, but not always, the skink will regenerate its tail, though it will never be as long as the original. Named for the way its tail shatters into many pieces when it feels threatened, the slender glass lizard (Ophisaurus attenuates) is the only legless lizard species that inhabits Illinois. The scales of slender glass lizards contain bony plates called osteoderms; these structures provide the animals with some protection from predators, but cause them to feel stiffer than snakes do when handled. Slender glass lizards reach up to 42 inches in length, and they hunt insects, arachnids and small vertebrates. Distinguish slender glass lizards from snakes by noting their eyelids, which all snakes lack. Eastern fence lizards (Sceleporus undulatus) are the only lizards found within the state of Illinois that have keeled, rather than smooth, scales. These keeled scales help the 4- to 7-inch-long fence lizards to camouflage within their surroundings. Eastern fence lizards are sexually dimorphic; while females have white or mottled ventral surfaces, mature males have bright blue patches on their bellies. Fence lizards are excellent climbers, and they spend much of their time climbing trees, fence posts and rock outcrops. Six-lined racerunners (Cnemidophorus sexlineatus) are the fastest lizards in the state, and they use their incredible speed to escape their primary predators -- hawks and snakes. Reaching almost 10 inches in length, racerunners have wide ventral scales that differ markedly from the small ventral scales of skinks, with which they are sometimes confused. Racerunners are almost exclusively terrestrial, preferring hot, open, sun-drenched habitats. Racerunners primarily consume invertebrates, including spiders, beetles and flies.